Germany & Austria Part IV January 9, 2009: The red wines of Germany are coming on strong with sales and demand shooting skyward the last 5 years or more. Maybe it's me not getting to taste them or perhaps global warming allowing the reds to ripen fully, but in either case I am really excited about German red wine. 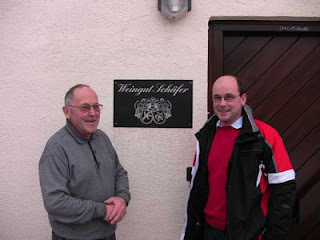 At the Schäfer estate we meet up with Volker Schafer and his father Karl-Ludwig. The Schafers are red wine and specifically, Pinot Noir producers, and we have featured their Pinot Noir Spatlese and Auslese back home. This cellar is one of the few we visit which is not polished for press photos, it's wet, dark, old, covered in black mold - I love it. The wines are the exact opposite - clean, bright, fresh, full bodied and not oaked. The dad had a friend many, many years ago who gave him some Pinot Noir vines, so he stuck them in the ground. Now they are one of the top red wine producers in the area. These guys were doing German red wines before the color was invented. We taste Blauer Portuguiser, Merlot, Pinot Noir, Dornfelder, and Cabernet Sauvignon- all reds. Then we go to their whites. Cool stuff like a Siegerrebe, Kanzler and Pinot Blanc to name a few. This afternoon we finish off 25 wines and finish with a 1971 Portuguieser Spatlese (38 year old red wine). This was the very first vintage of red Portuguiser Volker's dad harvested. 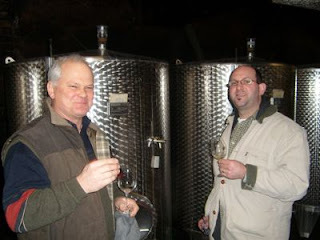 Next stop in the Mosel is to an old favorite and friend, Stefan Bollig of Bollig Lehnert. We sit in his kitchen with his lovely wife Jill and taste through Riesling and Pinot Blanc. Stefan’s style is different. He is outright and upfront about liking sweet wine. His wines all tend to show sweetness on the finish even if they are labeled dry. 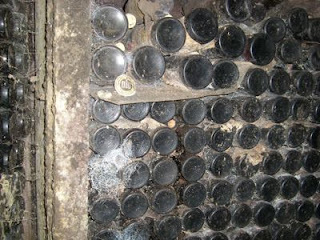 However, he builds his wines using traditional techniquues which means the wines show better several years down the road. Stefan wants to make wine for future drinking. The market often demands the latest and greatest, and he struggles with this because his best wines right now to be drinking are 2003, 2004 and 2005, not the 2006, 2007s which customers ask for because they are the "freshest." Bollig-Lehnert still uses a designation called Hochgewäch on the label "special designation" for a stand out wine in a vintage. The problem, and there’s always a hitch, especially in German wine law, is this special designation can be for sweet or dry wine and doesn’t help the customer know what the wine tastes like. It’s just "special". The press murdered the German 2003 vintage, but as I taste some 2003s this trip, they are really coming around. I think the press got this wrong and I will go on record now. Stefan stands by his 2003s confidently and they are really drinking nicely today. 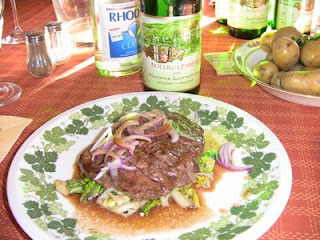 He treats us to a bottle of his 1994 Riesling Kabinett Feinherb. This is remarkable and shows “all growed up flavors” of shitake mushrooms, lemon pound cake and ginger, and it’s totally dry on the finish. perfectly and a great example of red meat with white wine pairing. We end the meal with a Beerenauslese which is honey and liquid golden raisin in the glass. It's elegant, not heavy or cloying and just sweet enough to finish the meal. Without haste we are off to another Mosel property, the Studert-Prum estate to see Gerd. Prum is a common name in Germany and especially in wines from the Mosel. My first question is "who are all the Prums?" Gerd explains in the immediate area some are related cousins and such. The largest estate is JJ Prum, followed by SA Prum, coming in third our Studert-Prum and finally the smallest related wine Prum is Weins-Prum. The amazing thing is that all four of them are Pradikat (top quality) producers and all from the Mosel and all with different styles. We dive in with 12 wines to work through on the table. Sitting at a small round wood table in the entry way of their home, I am surrounded by antiques Gerd’s father has collected over years. He apologizes for the clutter. I am perfectly happy to sit amongst treasure going back decades and wish I had more time to look at every little trinket. We start red with his Dornfelder Feinherb wine. The Dornfelder grape continues to show quality from good producers (see the first post from Germany, Day I). This example is grapey with moderate tannin, light acidity and has a hint of residual sugar in a pleasing way. Dornfelder tends to grow abundantly and Gerd says the challenge is pruning back regularly to keep yields low. concentrate and they want everyone to use the stuff around all of Europe. Currently, beet sugar or cane sugar is used. Of course most wineries are against this measure. It doesn’t benefit anyone but the producer of the concentrate and the there’s the thought of a German wine containing 10% Italian grapes! I also learn that German wine law approved the use of “Private Reserve” on a bottle of wine starting in December 2008. Of course this has no meaning and once again the consumer is presented with yet another confusing wine label term. Sort of like Reserve having no legal meaning in the US on a wine label. Humph. We finish with a treat, the 1997 Riesling Auslese. The wine is a mere 11 years old but sure tastes fresh like a fruit cocktail with a little mushroom and lively acidity. Gerd walks me through the cellar where I can see my breath it's so cold. 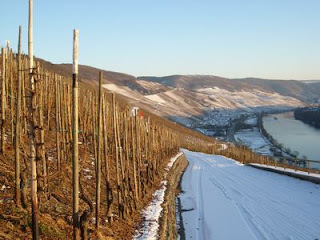 The Wehlen area of the Mosel is planted to Riesling, of which 99% is ungrafted original rootstock. I look at the trellising and see the vines are trained straight up on poles rather than in rows on wires, typical of this area. And off we go toward the Rheinhessen. So much time, so little wine. Scratch that. Reverse it.